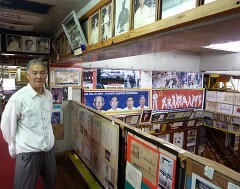 On April 11 in Nishihara, Tetsuhiro Hokama introduced various materials displayed in his karate museum. Twenty-five years have passed since Tetsuhiro Hokama, president of the Okinawa Gojuryu Kenshi Kai Karatedo Kobudo Association, opened a private karate museum in Nishihara. The museum exhibits more than 400 items related to Okinawan karate. Hokama diligently collected these items to avoid their significance being lost upon society. Exponents of karate who came to study the martial art in Okinawa, where it originates, have visited the museum from about 140 different countries and regions and the total number of visitors has now exceeded 3000 people. Hokama pledges to continue his efforts to support the global tradition of Okinawan karate. Hokama started to learn karate at the age of eight. When he was at university he realized that materials related to Okinawan karate had not been systematically collected, so ever since he has collected such materials while working as a teacher in commercial high schools. In January 1987 he went on to open a museum in the Yonashiro area of Nishihara and 18 years ago he moved to Uehara, still in Nishihara, where he built a dojo on the first floor of his house with the museum above it on the second floor. Materials related to karate on display include photographs of past exponents, kobudo gear and documents as well as posters. Hokama said, “It is important to appreciate the position karate has occupied in the history of the Ryukyuan society.” The museum exhibits models explaining aspects of the lives of people in ancient Okinawa, agricultural tools and geta (a form of traditional Japanese footwear) made of stone. Hokama carefully stores patches of karate jackets that the visitors from other countries left behind, and admission tickets of karate contests held in Okinawa, which make the museum unique.